About Us Patene Building Supply Ltd.
Our mission is simple: to provide our customers with the best selection of high quality interior and exterior building products and finishes at competitive prices. Our friendly and knowledgeable staff will provide service levels that are the class of our industry. We have been servicing contractors, homebuilders and home owners in Ontario as well as Manitoba for over 60 years. Patene Building Supplies has office and warehouse facilities in 15 locations to serve you better. Our huge stock of inventory, multiple locations, and large truck fleet are designed to get your products to where you need them – quickly. Our experienced, knowledgeable and friendly staff goes that extra distance to help ensure your success.That's why we carry the construction industry's best materials to help ensure that you build a quality end product for your customers or yourself. the supplies you need on your next project. We go the extra distance to find the finest suppliers of modern building materials to give you the fit, finish, durability and high standards that you should expect in your home or building project. We know that if you’re not happy, we’re not happy. That’s why we make every effort to get you what you need when you need it. But don’t just take our word for it, take it from our customers. With our fleet of over 90 trucks we can get your materials to your building site, to the spot you need them, on time. That saves you time, money and effort. Our mission is simple: to provide our customers with the best selection of high quality interior and exterior building products at competitive prices, with a motivated and knowledgeable staff and service levels that are the class of our industry. 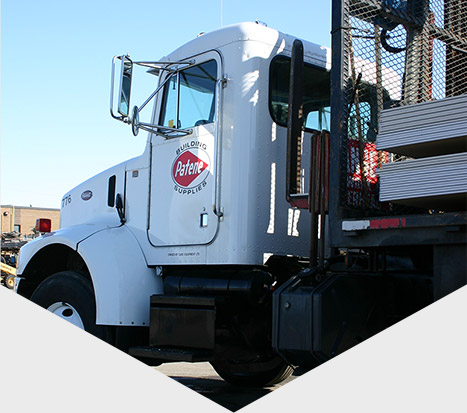 Servicing contractors and home builders of all sizes in Southwestern and Northern Ontario as well as Manitoba for almost 60 years, Patene Building Supplies has office and warehouse facilities in 15 locations to serve you better. Our huge stock of inventory, multiple locations, and large truck fleet are designed to get your products to where you need them – quickly. Our experienced, knowledgeable and friendly staff goes that extra distance because they want you to be successful. All of which explains why we carry only the best products in masonry, gypsum, roofing and landscaping to help ensure that you build a quality end product for your customers or yourself. Find out how we can help you find the supplies you need on your next project.